What’s the difference between these two brushes? The short answer is the brush head and the colour. That’s it. We talk about the differences in more detail below and there’s also a hands-on video comparison at the end of the article. Really it depends on price – you can check the price of the Pro 2000 on Amazon here or the TriZone 2000 here. Because the heads can be changed so easily (as we cover in more detail below), if one brush is vastly cheaper than the other you should choose that one. However, it’s unlikely there will be much difference in price. If prices are similar, it is a bit like asking would you like a jam or custard doughnut. Both are sweet on the tooth and filling, but it is your preference. As a leading electronic toothbrush company Oral-B produce quality brushes that are reliable with good battery life and comfort in hand. Take into consideration the way the two brush heads work differently and pick which you think you will prefer. At the end of the day, you can always swap. If you have a preference for the colour green but like the Pro brush head, buy a TriZone 2000 and pop on a Pro series head or vice versa. If we were going to buy any it would be the Pro 2000. Is the difference really only the brush head and brush colour? By removing the TriZone brush head and replacing it with a rotating oscillating brush head purchased separately (see the full range of heads available in this post) you can make the TriZone a Pro series brush. You can then swap the Pro 2000 brush head for a TriZone one (available to buy here) and make the Pro a TriZone. It even says this on the box of the TriZone 2000. The only remaining difference would then be the colour of the brush handle. The TriZone handle tends to be a combination of green and white, whilst the Pro is generally blue and white or pink and white. Both use the same brush handle, the same motor, the same charger. Both have a visible pressure sensor, a waterproof handle, 2 minute timer, charge level display and 2 modes for cleaning daily and gum care. So what is the difference between the brush heads then? 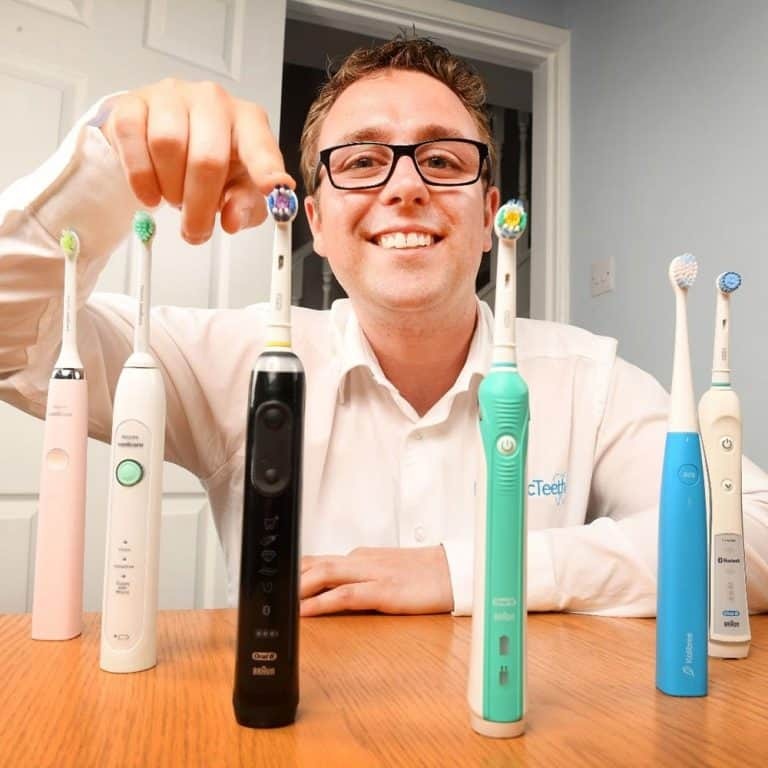 Whilst it is just the brush head that is the primary difference, the way the brush head works can be quite significant to you, in terms of how you prefer to brush and how comfortable you feel with an electric toothbrush long term. We have a detailed post explaining the differences between Pro and TriZone here, but a brief explanation is that a TriZone ‘sweeps’ against the teeth more like a manual brush whereas the rotating oscillating of the Pro series moves in more of a circular motion as well as pulsating which assists in breaking up plaque on the teeth and gum line better than a manual and to a point a TriZone head. There has been and will continue to be debate over the most effective, however there are countless studies that recommend the advanced nature and technology that is part of the Pro series. Electric brushes from any brand be it Oral-B, Philips or Panasonic tend to claim that they can remove 100% more plaque than a manual brush and this is virtually agreed by most dentists; thanks to the power and consistency they offer in comparison to the less consistent brush strokes and power offered by the human hand. More important than anything is actually brushing twice a day for 2 minutes. The regular cleaning, even if not perfect goes a lot further. However, if we had to pick one, we would go with the Pro. and most dentists would agree. Should you prefer or have reason to believe the TriZone would be better suited to you, then go for it. Hey, you can always change in the future. Not really. At the time of writing there is £3 difference between the two, with the TriZone 2000 being the more expensive at £33 compared to the £30 of the Pro 2000. These figures are based on the cheapest online pricing. Both have a recommended retail price of £69.99, but do not pay that – you are being robbed if you do – because they are often reduced to almost half of that. 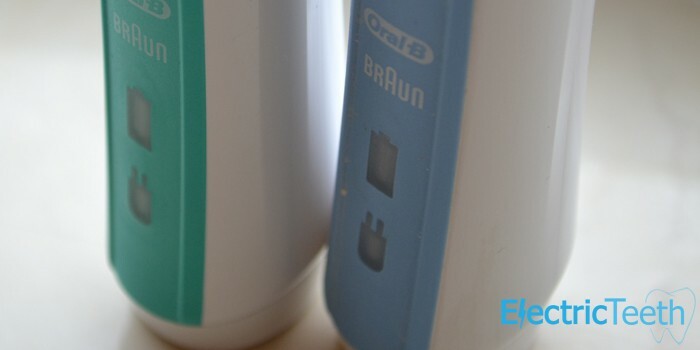 To see more brushes side by side, visit our Oral B Toothbrush Comparison Page. Thanks for the detail comparison, I brought the T2000. After one night charged, the green light keepsparkling, is normal? When you say the ‘green light keep sparkling’. What do you mean exactly? Presumably you mean the green light behind the battery icon on the front of the brush handle. Does it flash, or remain a solid green colour? Are you seeing this activity when it is sat on the charging stand or when it is off the stand? Usually it flashes until the brush is fully charged, at which point it turns a solid green and turns out. If you can provide a bit more information, I can try and help further. After 24 hours on charge, the green light should go out. I would leave it on charge for another 24 hours just in case and if it continues you might want to speak to Oral-B as it might be faulty, as it should be fully charged by then for sure. Thanks alot for the comparison, which has answered all my questions. Was in Morrisons yesterday and they had the Pro2000 & Trizone 2000 side by side for £35 each. Tried to see what difference there was between them by reading the info on the boxes, but came away none the wiser!. Will look on-line to see if I can get the Pro 2000 for £30, but sometimes it is less hassle to pay a bit extra in price to buy locally, so if anything goes wrong within the guarantee period you do not have to worry about the hassel of postage and package sending it back for a replacement or refund!. Its disappointing that the boxes are so poor at explaining the differences, but glad what we put together has been useful. Totally get how local purchase can be easier. If you have any questions, please do ask.